You might think it unlikely that a girl raised as one of six children in a middle class family in Guatemala City would grow up to be one of the world’s foremost research scientists. But if you knew Carolina Barillas-Mury, you would understand. Her keen intelligence and vibrant personality come across the moment you meet her. 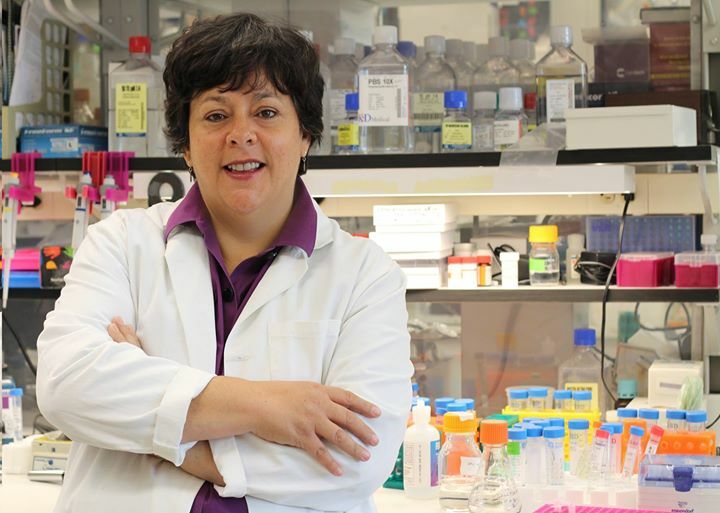 Carolina’s career achievements are impressive: they include a tenured position as Distinguished Investigator at the National Institutes of Health (NIH), a Sanofi-Pasteur Award for contributions to neglected and tropical diseases, and election to the the US National Academies of Sciences. She lives with her family in Maryland; her husband is an engineer and a systems analyst at NIH, and they have a 13 year old daughter who loves to write. Today she studies mosquitoes and how to block the transmission of malaria, work that may impact the future of millions of people around the globe. Her story is one of family support, strong female leadership, and the value of education. Carolina eventually decided to pursue medicine for two reasons: first because of the excellent medical training available in Guatemala, and second because she saw that there was important work to be done. She finished her Bachelor of Science degree at 19, and by age 24 had completed medical school. Her research thesis (studying the effect of yeast-derived beta-galactosidase on lactose malabsorption) was one of the first to demonstrate the effectiveness of Lact-Aid in children. At the hospital, she loved the patients, but clinical work was difficult. Public hospitals in Guatemala are undersupplied and understaffed. They are also very hierarchical, with a culture of “the boss is always right”, leaving very little room for discussion, opinions, and exchange of ideas. Fortunately, Carolina was exposed to the excitement of research science early on. During medical school, she completed a four-month rotation at Instituto de Nutrición de Centroamérica y Panamá (INCAP) with biochemist Dr. Oscar Pineda, where she was encouraged to ask questions, inquire, challenge, and learn. She found her work there fascinating and intellectually stimulating. But there were (and are) no advanced research degrees in biology available in Guatemala. In an article from October 2014 in The NIH Catalyst, Carolina joked that, “dreaming of becoming a research scientist was like saying you’re going to be an astronaut in a country without a space program”. To become a research scientist, she would need get a PhD abroad. With no financial resources, she needed a research assistantship or scholarship from an institution abroad. Over the next two years she wrote letters to professors, applying for research positions, and visited embassies, applying for fellowships. She finally landed a research assistantship at the University of Arizona in Tucson, and in 1987 started her PhD fellowship. The University of Arizona had recently established the Center for Insect Science. Carolina joined the lab of Dr. Mike Wells, one of the first to be developing molecular tools to study insect biology. She helped develop and use these molecular tools to study Aedes aegypti, the mosquito that transmits many viruses, including dengue, yellow fever, zika, and chikungunya. In 1993, after earning a PhD, Carolina was offered the opportunity to study malaria transmission in post-graduate studies at Harvard. This began her passionate quest to find ways to fight this destructive and seemingly intractable disease. Coming from a medical background in a tropical country, Carolina had seen first-hand the effects of mosquito-borne tropical diseases. Malaria is one of the most devastating diseases in human history, and remains a scourge. Even with bed nets and pesticides, malaria kills an estimated 500,000 people a year, 90% of whom are children in Africa under the age of five. Mortality aside, malaria is a key contributing factor to underdevelopment. In high seasons, everyone in endemic areas is infected 3 or 4 times a year. People receive hundreds of bites a day, with dozens of infected bites. With that rate of infection, the only way to eradicate the disease is to control the vector. In the early 1960’s, the World Health Organization mounted an international effort to eradicate the mosquitoes that carry malaria, with mixed results. While the mosquito was beaten back in some places, reinfection and pesticide resistance ultimately showed that this strategy would simply not work globally. Part of the problem is that, to be effective, mosquitoes must be eradicated everywhere. Carolina explains: “Even if you eradicate the mosquito in a village, someone infected comes from somewhere else, and within 2-3 years you’re back where you started. Once a single mosquito is infected, it can infect everyone in a home in a night or two.” Carolina’s goal was to understand how mosquitoes carry and pass on the parasite, and perhaps to find a way to block transmission. After a year at Harvard, Carolina’s adviser, Dr. Fotis Kafatos, moved to Heidelberg, Germany to become the director of the European Molecular Biology Laboratory, one of the top laboratories of its kind in Europe. Carolina followed him to Germany and worked at EMBL for nearly five years. She obtained Alexander von Humboldt and Swiss National Science Foundation fellowships to fund her research and continued to develop new techniques for studying malaria transmission. Returning to the U.S. in 1998, Carolina became an Assistant Professor at Colorado State University in Fort Collins, where she started her career as an independent investigator. Then, in 2003, after six years in Colorado, she relocated once again to begin work at the National Institutes of Health (NIH) in Bethesda, Maryland, where she still works today. She focused her research on how mosquitoes become infected with malaria. Why would the infection of mosquitos be of interest? Isn’t it more useful to study how humans get infected? While it is true that some scientists study human infection, there are good reasons to understand how mosquito infection occurs. For a mosquito to infect you, the mosquito must itself be infected. But why doesn’t the mosquito’s immune system attack and eliminate the parasite? She sees potential for practical applications for her research. “We are going through a very exciting time. My dream would be that some of our discoveries would ultimately lead us to new solutions to prevent malaria transmission… Now we are working on developing a vaccine so that antibodies to this key will remove this weapon from the parasite. This would allow the mosquito to detect the parasite and destroy it so transmission will be much less effective.” This kind of strategy, called a “transmission-blocking vaccine”, could be used in conjunction with other treatments to block the parasite’s life cycle at multiple points. The hope is to eventually stop transmission altogether. The discovery of the immunity evasion gene, among other things, has led to worldwide recognition for Carolina’s research: four papers in the journal Science, the Bailey K. Ashford Medal for contribution to tropical diseases, the Sanofi-Pasteur Award, and Distinguished Investigator status, awarded to the top 2% of tenured researchers at NIH. Carolina Barillas-Mury at the National Institutes of Health, Bethesda, MD, ca. 2014. Image courtesy of José-Luis Ramírez.